by admin • Comments Off on The Best Flowerhorn food, What is it? The answer isn’t necessarily ONE particular food, Really the best food is a variety of different foods. This philosophy is beneficial for the fish for a few reasons. A well balanced and diverse diet helps make your fish look it’s best but also feel it’s best. As a hobbyist, we want to make sure that our fish are healthy as well as beautiful. Xanthophyll: is a carotenoid pigment containing oxygens, Xanthophyll is responsible for bringing out yellow and orange color hues. Astaxanthin: which is found in krill is very valuable for human and animal nutrition. Astaxanthin is also rich in antioxidants and red pigment. In the aquarium hobby especially Flowerhorn keeping color is so important, everyone wants their Flowerhorn to display brilliant coloring and Astaxanthin is a key component. Spirulina: is a biomass of blue-green algae that is beneficial for humans and animals. When Spirulina is consumed by the Flowerhorn cichlid and other fish it provides increased immunities. Therefore this ingredient plays a vital role in preventing your fish from contracting various aquarium diseases. Different Flowerhorn foods on the market all contain various volumes and percentages of these ingredients and this in itself is why mixing up your Flowerhorns food is so important. As living creatures ingest things whether it be or drink we can start to build up a tolerance for it. Think of someone who drinks alcohol they start to require more and more to feel what they used to feel. A similar thing can happen to your Flowerhorn too much of the same ingredients over and over they can hit a wall and not receive the benefits like they should. If possible switch the food you feed your fish every couple of days. 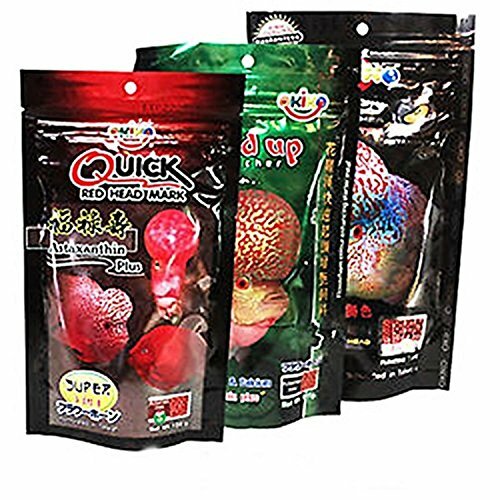 Set of OKIKO is a unique formulated fish feed to induce speedy head growth for all Flower Horn Breed. Shape of head growth will also improve through constant feeding. Rice in High quality calcium formula help the growth of the fish front. High content of spirulina and Krill extracts with other natural color enhancing elements that will improve the fish's sparkle dots in 1-2 weeks. Okiko is awesome you’ll only hear good things about it, tons of Flowerhorn owners will agree that the price is right, quality is there and the fish love it. Okiko Platinum, Grand Sumo, Hai Feng Fast Color and Hikari Cichlid Gold. I will also feed my Flowerhorns with dried blood worms, cucumbers, peas and diced prawns. If you really want your Flowerhorns color to pop try mixing in food specifically made for Blood Parrots! Try this technique and watch the red colors in your Flowerhorn become radiant. I’d suggest feeding simple Hikari Blood-Red Parrot food it’s inexpensive and works great. So then there really is NO best Flowerhorn food but the best is a combination of top quality dry Fish foods, vegetables, crustaceans, and insects. By feeding your Flowerhorn a well-balanced diet and not overfeeding you will have a beautiful fish that will live a long time. If you want to see specifically which foods we use links are in the description. Comment what videos you want us to make next! Thanks for the support! The grand debate! Which Flowerhorn food is the best? This video breaks down the answer and even goes a little into which ingredients to look for in your Flowerhorns food. We recommended varying the diet, this is really the only way your fish will reach optimum health, color, and size. Below you can find the best prices on all the mentioned Flowerhorn foods. ← How Long Does a Flowehorn Live?